Identifying the system your assumptions build is a giant first step in helping teams improve. 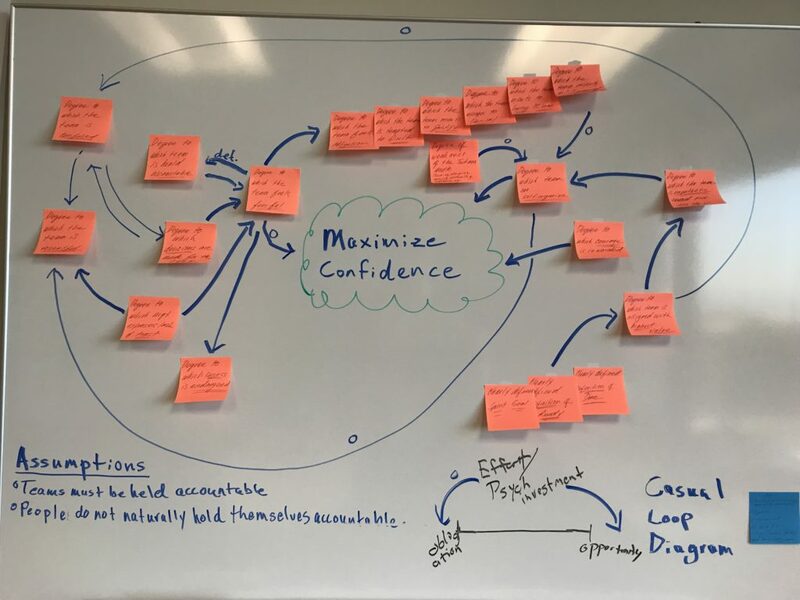 Let’s use systems thinking to briefly examine a causal loop that either increases or decreases the team’s confidence. We begin with the assumption that “teams must be held accountable, because people do not naturally hold themselves accountable.” The domino effect this creates is amazing. The typical reaction to an “accountability proclamation” is fear. There are likely exceptions, but generally holding a team accountable and creating a fearful team is the same. Fear generally triggers a chain of responses. Some of these are feelings of obligation, temptation to quit, tendency to justify, denial of issues and laying blame. Likewise an entire arsenal of spin tactics will probably be employed to protect the intimidated team. Because the team is under existential threat, its members will not want to make decisions. Thus, you are forced to micromanage. Confusion will eventually become a serious problem, because you are unable to leverage the wisdom of your team. This confusion may lead the team to become resentful. By now the success of the team or product or both are probably in serious doubt. The team’s confidence has all but disappeared. Now, let’s briefly examine a more cheerful scenario. Let’s assume your team is naturally accountable. This automatically reduces fear, removing the “flight or fight” necessities of justifying, denying, laying blame and employing spin tactics. The team finds new energy not to quit and a feeling of obligation gives way to greater sense of trust. This leads to greater respect enabling your team to self-organize. Self-organization leads to better decisions reducing confusion thus removing the need for you to make decisions for them. As fear decreases the team no longer feels endangered. This allows room for courage leading to greater innovation and higher quality. This enables the team to create greater amounts of customer value leading to an increased sense of good will (empathy) between the customer and the team. Increasing value enables setting more effective goals around which the team and customers will gladly rally. Focusing on this success maximizes confidence. You have confidence in your team. Your team has confidence in themselves. Your customers have confidence in your products. As this example illustrates, decisions based on weak assumptions lead to unfavorable consequences. If you want to avoid this problem, you must form the habit of examining and correcting your assumptions. If you’re ready for frank discovery, creating a Causal Loop Diagram using systems thinking along with a trusted colleague with whom you don’t always agree is a great place to start. Let’s do this by writing one of your important goals at the center of a white board. In the left bottom corner, write the assumption that stands behind or opposes this goal. On separate Post-Its list the variables that impact this goal. Place these around the goal and begin noting how they relate to each other using basic Causal Loop symbols. By focusing your conversation on these variables and their relationships to each other, a system should emerge that corrects your assumption. Changes in your thinking enable stronger support for your goal. As you saw in the narrative above, if you assume your team naturally holds itself accountable, you can have a confident team. The system created around a confident team brings with it several positive attributes, leading to happier customers. This is the simple Causal Loop diagram created to expose the consequences of “holding teams accountable”. Begin putting your assumptions to the test. The Systems Thinking page on LeSS.Works should give you enough information to get started. There you will also find a handful of great resources. To further spice up your conversation, I’ve added the link to a helpful post on critical thinking. Additionally I’ve added a couple of great books and posts which influenced the example I created. Your assumptions have consequences. Understanding the these consequences should enable you to become a better manager, coach and human being. For a deep dive on how systems thinking impacts organizational effectiveness, consider taking a Large Scale Scrum course. UCLA Brain Mapping Study – Increasing empathy increases altruism.